This was a two time Pete's week for me so I've consolidated both experiences. As you may know, Gramercy Guy and I recently adopted a rescue dog, Studley McGoo (if you see him being walked near the park, be nice to him, he's still getting used to his new life). 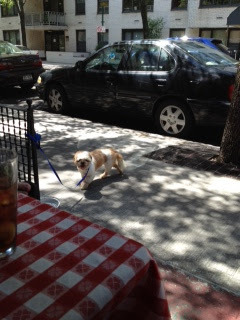 So when my mother, the queen yenta came from Yenta-ville to spend the day with me, I thought Pete's would be a good brunch choice as they are dog friendly in their outside seating, you can see Studley is enjoying the shade and was given a bowl of water. Pete's is across the street from Friend of the Farmer, which always has a long line for brunch. Don't get me wrong, I really enjoy Friend, who doesn't like their eggs served in a skillet, but I don't need to wait in line for them. 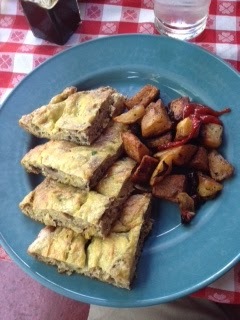 Pete's is just as good, even if my eggs come on a regular plate. 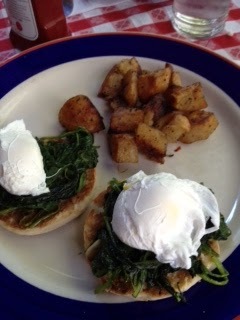 For brunch, I had the eggs Benedict Florentine (hold the hollandaise). It was excellent. The yolks were perfectly runny when I sliced into the egg. 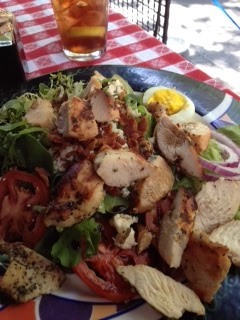 And the queen yenta had the cobb salad with chicken (she says the salad didn't need the chicken because it was chock full of other stuff like bacon and eggs and blue cheese). This was a great outing, and Studley was well behaved. This may have been his first time at Pete's but it certainly won't be his last. A few days later, the Girls of Burger Club (TV Doc and Georgia Peach and me) had girls night planned. No boys allowed. They came over to meet Studley and then off to Pete's Tavern we went. Once again, the food was as good as the company. 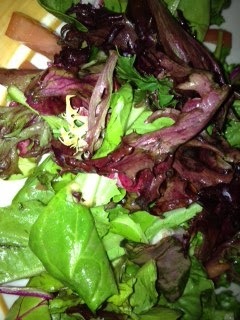 We started off with a mesclun salad (need some greens). 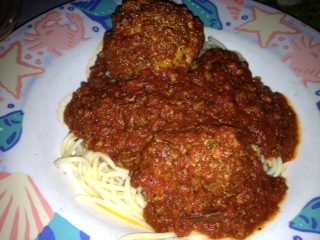 For dinner, there was spaghetti with veal meatballs all around. Pete's meatballs are big but not heavy and very flavorful. A nice touch that not too many places do, it's served in a meat sauce. I'm not sure which is older, the place or the recipe, either way, I hope they both never change. And the portion is so large, that I barely touch my pasta. Have you been to Pete's and what your favorite dish there? Who's going to say burger and a Pete's Ale?